This is the first post for our 2012 Trip to Japan travel blog! 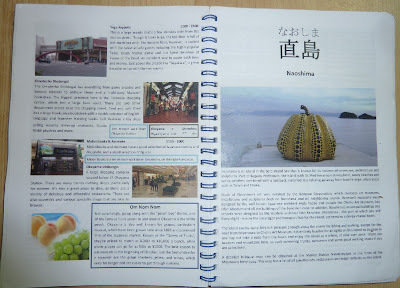 You can start here at the beginning or visit the summary at 2012 Trip to Japan introduction and conclusion. Our first trip to Japan was during the first half of December of 2011 and we had an amazing 18 days sightseeing in Tokyo, Hakone, Kyoto, Hiroshima, Miyajima, Osaka, Nara, Kanazawa, Takayama and Nikko. Since the decision to go to Japan in 2011 came only weeks before we planned to leave we ended up paying full price for the flights. With Jetstar this came to around $1000 return. We thought this was a reasonable amount after paying around $2000 to fly to Europe with Royal Brunei the previous year. Once we got back from our first trip to Japan we returned back to work and had nothing on the horizon to look forward to. You can imagine our excitement when, at the beginning of May, we discovered that Jetstar were having some kind of one day only birthday sale. It was a buy-one-get-one-free situation. With baggage and everything included the return flights from the Goldcoast to Narita cost $539 return. The only catch (or so we thought) was that this was for one day only! Ah! They got us! After quickly organising leave and booking the flights we found out the next day that not only were the sales continuing, the conditions were also slightly better with the cheap flights available in the preceding and following weekends. We also later learnt that these cheap fares are a relatively common occurrence. However, what we ended up with was still good, and it spurred us to actually commit and make the booking. We were admittedly a bit doubtful about how short the sale would be in the first place. We ended up with an all day Monday flight arriving into Narita at 7pm on Monday, 22 October 2012 and an all night flying out of Narita at 8:25pm on Friday, 9 November 2012. This gave us 17 nights in Japan with a total of 18 usable days and the excitement had begun! With the large amount of time (nearly half a year) until our trip, there was plenty of time to plan. So, naturally, the work quickly expanded to fill the available time and I found myself busily making a guide on what to do which eventually ended up becoming 140 pages long. This was called the Japan Book. Before that though we had to decide where exactly we wanted to go- which itself was quite a large amount of effort. We wanted to fill in the gaps we missed last time and see some different places, so we set our sights on Tōhoku, Hokkaido, Chūgoku and Kyūshū. 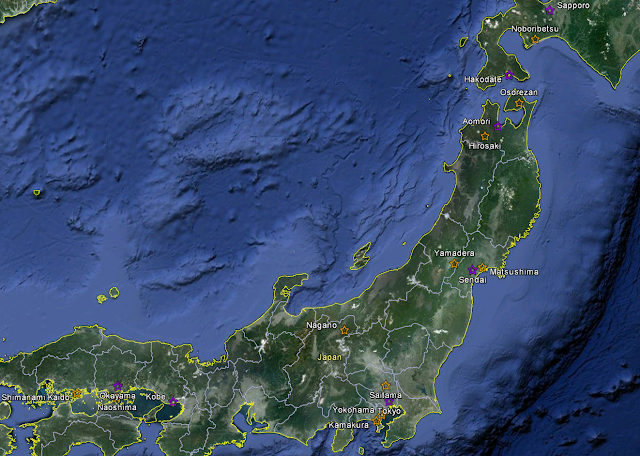 Unfortunately the latter two locations are at the complete opposite end of Japan to the former two. This was due to visiting many places in the middle of Honshu on our last trip and presented quite an issue. We also wanted to visit Nagano to see the snow monkeys as well as other places in the Kanto area including Fuji 5 Lakes, Kamakura, Yokohama, Saitama as well as a few more locations within Tokyo such as the Sky Tree, Ikebukuro, Akihabara and Nakano. We decided on a 14 day rail pass which meant we would have 14 days for long distances on the rail roads leaving another 4 days for Tokyo and surrounds. In order to not visit the northern parts while they were too cold the plan was to travel north first. We didn’t want to do too much travelling by train in one day and we also wanted to try and stay in one location for at least 2 nights so we didn't have to lug the luggage around too much. The plan was to stop off at Sendai, Aomori and Hakodate on the way to Sapporo which was as far north as we decided to go on this trip. The problem then was getting back down to Chūgoku from Sapporo. We considered a number of somewhat radical solutions including getting a night ferry from Tomakomai to Hachinohe, a night train from Sapporo to Aomori or sacrificing a whole day to travel on day trains. We then discovered the recent introduction of true Low Cost Carriers to Japan’s airspace. This meant we could simply fly from Sapporo all the way down to Osaka. While I wanted to fly on Peach due to their pink uniforms and aircraft we found that Jetstar was the cheapest and most convenient. The flights came to only $70 each including baggage. In a bid to reduce total time spent travelling we also cut out Kyushu altogether and opted for Okayama and Kobe instead- we figured we could spend a whole other trip exploring both Kyushu and Shikoku. After deciding on locations and hotels our outline looked like this. The plan was to activate a 14-day Japanese rail pass on the 23 October 2012 to visit the snow monkeys in Nagano on 5 November 2012. We would work our way up north to Sapporo from which we planned to take a late flight (so we could make the most of the day) on Tuesday, 30 October 2012. Since the train from the airport took around an hour and in case there were delays we planned to spend the night near Shin-Osaka before getting an early train down to Okayama the next day. After visiting Kobe we planned to take a late afternoon train to Tokyo where we would base ourselves and make a number of Day trips. This is a summary of all the locations we managed to visit with the places we stayed overnight marked in purple. We printed this A5 doubled sided (full colours!) and had it bound. We had a black and white A4 one last trip but found it a bit big. It was incredibly useful. Allowed us to pack a lot of things into one day and use our time wisely. This is my mobile phone, it has the Android Revolution ROM installed. When I was studying cards using Anki I put it in flight mode and I was getting around 5 hours screen time which I thought was pretty impressive. I use a desktop at home and I purchased this netbook back when I was in university. It’s old and slow but bigger than my phone and lets me use the hotel internet if they don’t have WIFI. I took a mouse and a long LAN cable as well. This was for my phone, you’re not able to make any calls but it was very handy for using the internet while we were out and about. The most useful apps were Hyperdia Lite and Google Maps. I had all the places we were going stored as locations in “My maps” in the Google Maps App. When not in flight mode having this SIM seemed to chew through the battery a bit. I suspect this is due to it trying to connect to a voice service? My old GPS from 2008, it was a backup in case the internet didn’t work but it did so we didn’t need or use it. These covered our long distance rail travel. Once I’ve finished writing up our trip I’ll calculate how much we saved. We paid $551 each to get them delivered from Sydney. $20 of that was for the courier but they just stuffed it in our letter box anyway. We might as well have gone with registered Australia Post. This is a credit card by GE money that lets you purchase things in foreign currency without having to pay any fees. No currency conversion fee, no annual fee, no dodgy exchange rate. You get the MasterCard rate which is very close to the market spot rate (within a few decimal points). We used this to book most of our accommodation. If you load up extra money into it you can withdraw it as well without attracting any cash advance fee. This is like the GE Money credit card except it is a proper savings account and it’s VISA. There are no fees at all, same situation. Citibank are a bit of a pain to deal with and their internet banking is horrible but the cheapness and convenience win out. Don’t sign up for their SMS security thing- it’ll drive you mental the amount of times they ask for it. The card itself was very useful in Japan and the source of almost all of our cash. We used 7-11 and post offices to access our money. The post offices were less conveniently open and located but they allowed you to get out any amount you like (as little as 1,000 yen). 7-11 ATMs only dispensed cash in 10,000 yen increments but were everywhere (except Aomori) and open 24/7. Balance inquiry did not seem to work at the post offices but it did at the 7-11's where a balance was given in JPY and USD. It’s always a good idea to have some local cash when you land. You can do a lot more with a little money than no money. I had a money belt but I ended up not using it as I was never really carrying that much cash and because Japan is so safe. I just used my wallet. Which is actually a purse. Shhh. We went with Ouch! I don’t know how good they are though as we didn’t have to claim anything. We also had all the usual stuff. Clothes, suitcases, medium sized backpack, small backpack etc. Hi! I first found your blog when I searched for things to do at Aomori. I really got hooked to reading your blog posts as they are not only informative but also fun to read. I usually find side comments annoying but in your case, I found it quite interesting. Can you please tell me where you got your Japan Book? And do you have an email? I want to ask you many more things especially about Aomori and neighboring areas since I intend to visit it this coming September 27-29. Hope you can read this. Thanks for sharing your time to log yours and Kate's adventure! Thank you so much for reading my blog! I'm so happy to read that you enjoyed it! I do worry that I say too much sometimes but hopefully those that find that annoying can just skim or skip :). I guess I didn’t really explain it too well but I didn't really get it from anywhere as I made it myself. It's a collation of information I found about the places we were going to. The information contained within is largely from Wiki Travel, Japan Guide and Hyperdia with additional information from people’s blogs and other tourism websites. I’d put it up online if it wasn’t for the fact that almost all the information belongs to someone else. I don’t mind emailing it though to those who are interested. I have en email address of course :). I don’t really want to put it up here though, since I’ll probably get sent lots of spam. My skype address is microseism89 if you have Skype, then I could send you my email. Or you can ask me questions here. Be warned though! I was only in Aomori for a couple of days so I’m by no means and expert. I’ll do my best however. Thank you very much again for reading and thank you even more for taking the time to comment! I really appreciate it! Enjoying your blog. I'm based in Japan, and recently took JetStar at intro. prices from Narita to Sapporo and return. The scarcity of info. about how to do Noboribetsu as a day return trip from Sapporo has inspired me to start a blog at http://sapporo-and-noboribetsu.blogspot.com/ that will contain this info. To answer your questions: I started to learn Japanese in night classes at a local polytech in NZ, did a brief (one-week?) intensive course on verbs and tenses, and did two or three Basic Japanese university units by correspondence. But I couldn't understand train announcements after arriving. It usually takes one or two years of living here to become reasonably fluent. I'm a telecom engineer, and become fluent in technical Japanese by reading ham radio and computer magazines; I also passed the Japanese grade 2 ham radio exam. I've been here over 30 yrs. (worked in-house as an tech. translator and copywriter for much of the time). Hi Keith, Sorry I didn't reply directly to comment, it looks like I accidentally added it and my questions below. In New Zealand? I'm going on there for a holiday in about a month- pretty excited! Sound like you got some basics out beforehand buy defiantly learnt the majority once in Japan. I've so far done two years of Japanese courses in University (split 50/50 with geology) and have continued on for another two years now just by myself. I'm learning a lot more that way though I would really need to spend a few years in Japan to become reasonably fluent. I recently took the N2 JLPT but I don't yet know how well I did. I managed to pass the practice exams at least. I can read manga fine with a dictionary and understand train announcements. Thanks you very much for giving more details on yourself! It's good to hear you've become a successful translator after learning Japanese as an adult as well! The BJT is more practical than the university-study-oriented JLPT. I was back in Aussie and NZ in Sept. (cherry blossom time in ChCh). Some low-rainfall areas may be a little brown in Feb. Can't comment on North of Auckland. Auckland has the Eastgate (North Shore) shopping center, MOTAT, and a maritime museum on the waterfront. Rotorua has hot springs, Waitomo has glow-worm caves. New Plymouth has its Fuji-like Mt. Egmont/Taranaki, and a great paved waterfront cycle track (connects to a Maori bush reserve). The museum is also good. The area is quite wealthy from offshore oil rigs. Wanganui apparently has some great native bush. Wellington has TePapa museum, the downtown Unity bookstore was also quite good. Stopped at Kaikoura about 3 hours between early and late buses, rented a cycle. The sea and snow-capped mountain views, track along the cliffs, and baby seal colony at Ohau are high spots. Hamner and the Japanese-owned Maruia springs are nice. Christchurch city center is still devastated after the quake; Riccarton and Northlands malls are relatively unaffected. The ChCh gardens are nice. Need transport but didn't find a convenient rent-a-cycle place. Queenstown and the booked-out-months-in-advance Milford and Routeburn tracks are good. A Rotary group organizes budget hiking trips (linked from my Japanese-language australia-new-zealand.blogspot.com ). NZ is about the same size as Japan, but local transport is more difficult. Worth searching out accommodation with cycles to lend or rent out where available. Tassie has a similar range of scenery in a tiny island you can travel round in three days. I havn't heard of the BJT before, or maybe just vaugly. It sounds harder than the JLPT, so it'll be something to aim for once I pass N1! Thanks for the comments and information about New Zealand! We're going to be doing a loop in a rental car around the southern half of the south Island, public transportation is nothing like Japan. At least we'll be able to drive a lot faster (and cheaper) though! We'll definitly be going back to New Zealand though, and I've noted down your tips. I think I'd like to hire a bicycle at one of our destinations too- sounds good. We were wondering what to do in ChCh itself actually so those gardens sound great. We missed out on the Milford track unfortunately! Instead we're going to dothe nearby Kepler Track- it looks pretty nice too. Plus a visit to doubtful sound. We'll save Milford track and fiord for another trip. I'd like to go to Tassie one day too! It's definitely on the list! I'd think that the BJT (focused on real-world conversation and real-world situations) is actually both easier and more useful than the academic kanji-oriented JLPT. You get just a score, not a pass or fail. Top-scoring people get an extra (later) spoken proficiency test interview to settle their scores. The Halls Gap area between Melbourne and Adelaide is nice, as is the Mt. Donna Buang reservoir area (but it's over 40 years since I was there). Hamner, Maruia, and Kaikoura are within about four hours north of Christchurch by car or bus. I personally find the Tekapo/Mt. Cook area freezing cold and rather barren. The Arrowtown/Cromwell gold-rush area near Queenstown may still be a popular tourist area. Arthurs Pass is a popular weekend (train or car) excursion from Christchurch. The Sign of the Kiwi/Summit Road is a nice drive, as are Akaroa and the Port Levy Road. (In the ski season, Mt. Hutt is a easy trip from Christchurch). The Christchurch Public Library web site has a lot of "What's On" community information. The iSites (Government Tourist web sites as well as physical information centers), particularly in tourist areas like Queenstown and Kaikoura, are friendly, well-informed and helpful, they will book accommodation and provide free tourist maps. Nelson (north of the South Island) has great peaches. I think areas like Gisbourne are also known for good food. The fresh fish (F&C shops) and Thai restaurants in New Plymouth were memorable. Some "New Zealand Chinese" fast food, like the place with the red sign opposite 100 Centaurus Rd. in ChCh, is amazing. It might save a lot of money to take buses between major centers then hire a rental car for local travel. Re. your comment on Skype above, Skype was purchased by Microsoft. You may have to upgrade to the latest version of the software in order to get it working again. Google Voice and Video (Google Hangouts) has similar functionality, you may like to try it. Well, I'll definitely look into it further. Unfortunately it doesn't seem that widely available outside Japan- I can't take it in Brisbane for example. Also, I'm generally learning for the sake of the actual language rather than any tests, the JLPT N2 was my first and I did it to see how I'm going mainly. Kanji is my strong part so I don't mind the amount in JLPT! I need to be faster though generally (reading/listening). Anyway thanks for teh advice! Oh no! We're going to Mt. Cook! Hopefully it wont' be too cold as it'll be summer at least. Thanks for all the other comments, and I'll look out for that chinese in ChCh. Food is something we sometimes struggle with since I can't eat onions. Appreciative the advice. It worked pretty well expect I usually missed calls unless I was expecting them as the ring part was a bit dodgy. Well, I've gotta finish this one first! I haven't been to either of the places you mentioned in Tokyo yet so I'll make sure to remember them for next time. How long have you been in Japan and what's translation like? I've been learning Japanese and sometimes wonder if I'd ever be able to translate and if it would be worthwhile. Did you learn Japanese as an adult? How was it? My husband two children and I used to live in Japan. We returned to the US in 2009 and now, finally are planning a return visit in January. I was worried about visiting Matsushima and Sendai because of the tsunami (worried that they weren't ready for tourists) on our way to skiing in Hokkaido and was happy to read that you visited recently and all seemed okay. We've been up that way before but I enjoyed reading about your adventures and am insanely jealous that you were able to visit three times in three years! Ah, well, I'm jealous that you got to live there! Thank you wonderfully for your comment!! I'm really glad you've enjoyed reading about our trips! When we visited Sendai and Matsushima we didn't see any evidence of earthquake or Tsunami damage at all. As far as I'm aware I think there's one road closed in Sendai and one of the islands in Matsushima had it's bridge washed away. It's not a major island though and there's a good chance we would not have visited that one anyway. Same for the road- plus there's just a detour. Tourism along the affected area is actually being heavily encouraged as it will aid recovery. In fact one of the worst hit areas of coast was designated as a national park for this purpose (the Sanriku Recovery National Park). I think the Sendai area will make a great stop and I hope you enjoy your skiing in Hokkaido! We've yet to go skiing but it's definitely on our to-do list. I don't know how long you'll be there but there's the snow festival in Sapporo in early February that I'd also like to go see one day. I'm planning something around the same concept for when i visit Japan this coming spring. It super useful, and really helps you cram more stuff in as all the research is already done. It's easy to go crazy though so it's important to be realistic about what you might actually want to see when you make it. I think I put to much things in, often when I know there's no chance we'll see a particular attraction. I don't mind sending copies to people, but don't want to directly link it here because it's mainly made up of stuff copied for other websites.